Our hair is healthiest in our twenties, when it is fully grown, but still young and strong. As time passes after this glorious phase, we grow older, as does our hair. There are plenty of obvious signs of hair aging, but in order to fully understand how our hair ages we must also comprehend the life cycle of a hair follicle. There are three phases in a hair follicle’s life: the continuously growing (anagen) phase, the transitional (catagen) phase, and the resting (telogen) phase. During anagen, the hair grows approximately 10mm a month. This phase normally lasts three to six years, and it is estimated that 85% of the hair on your head is probably in its growth phase. This growth is caused by the steady blood supply that the hair follicle receives, along with oxygen and nutrients that allow it to grow. After this blood supply slows down, the growth stops, and the hair just basically sits on the head. This is the second phase, catagen, which lasts around three months. The third and final stage is telogen, where the follicle rests for more time, and the hair falls out. This is not shedding, for the lost hair is replaced by new hair that is produced in the early anagen phase. This cycle continues throughout our lives, and, as previously stated, is at its peak during our early adult years, when the body is at its prime, and can generate the most energy and absorb the most vitamins and nutrients. When you reach your 40s, your hair will not be as strong, and will slowly decrease in health with age. Why does this happen? Think about this: when you get older, some of your body parts begin to fail you, such as your bones, kidneys, and arteries. The same happens to your hair. As we age, the pigment cells in our hair follicles gradually die. This will cause a lack of melanin in the strand of hair, causing it to turn gray or white. Another effect of aging on the hair is the thinning of the hair, which occurs because the follicle doesn’t function as well as it should because of its old age. Balding also occurs because hair follicles die and the dead follicles can no longer produce new strands of hair. Age can also cause hair to lose elasticity and strength, because of a dip in keratin protein (what the hair needs to grow), which makes the hair’s protective outer cuticle fragile. This dip in protein also causes thinning in hair, because keratin is the key structural component of hair, and without much of it, the hair cannot be as thick. The passing of time can also cause your hair to spend longer periods of time in the catagen (transitional) and telogen (resting) phases, causing the hair to grow less. 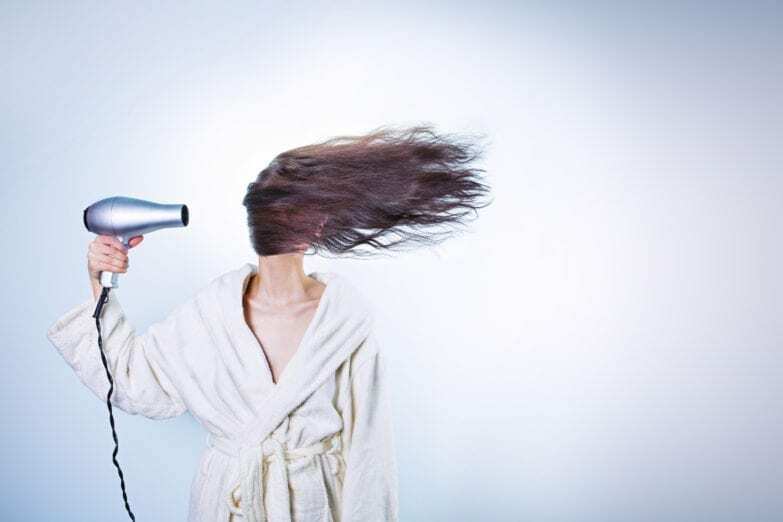 Additionally, the natural loss of keratin proteins and fatty acids cause the hair to appear duller, and be more vulnerable to damage caused by doing things you would normally do to your hair, such as blowdrys, coloring, and straightening/curling your hair. So, what could be the solution to maintaining healthy, young-looking hair? A trip to our salon could solve these problems. At Bliss Hair Studio, we are committed to make your hair look its best. We provide hair treatments using a variety of products from different companies to keep your hair strong, flexible, and healthy. We also do color corrections, whether it is to cover up gray hair, or to change the color of your hair completely. We also sell products from many reliable companies, and are willing to help you find products that contribute to the well being of your hair. So come, stop by! We would love to help you feel glamorous with your hair, regardless of your age!